This post contains four recipes. 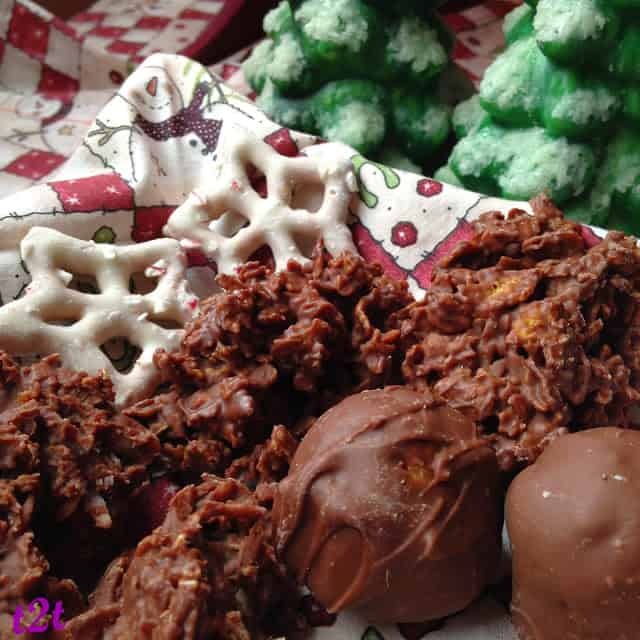 One recipe for: peanut butter balls, haystacks, corn flake clusters, white chocolate peppermint pretzels. All of the recipes are easy. The best way to make candy is to set up an assembly style work station. Have everything l lined up and ready. Make one batch of each ingredient at a time; coconut, corn flakes, peanuts and anything else you want to cluster. 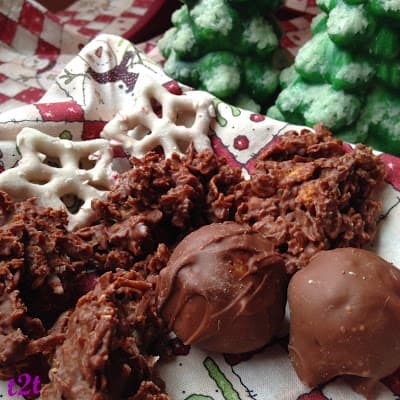 Make peanut butter balls and dipped pretzels, separately. Making homemade candy is easy, peasy. Follow a these few simple steps and you’ll be a cluster making machine! Melt the chocolate; use a double boiler here, it’s still the best and only way to melt chocolate. Mix in the coconut, corn flakes, Spanish peanuts or whatever else you want to cluster. Stir and coat well. Drop by teaspoonfuls onto wax paper lined large baking sheets. Fill one sheet at a time, working as quickly as possible. Set baking sheets outside or in a cool place to allow chocolate to set. If you live in a cold state like I do, then you are in luck. Set up a work station in your garage. Put some tables or saw horses with a sheet of plywood on top, in your garage. Cover with cotton backed, vinyl tablecloths and your good to go. Place clustered, filled baking sheets outside to allow the chocolate to set. When the chocolate has set up, store the chocolates between sheets of waxed paper in large, plastic containers. Ice cream pails work great for candy storing! In a large bowl cream butter, gradually add the confectioners’ sugar, cracker crumbs, peanut butter and vanilla. Mix together well. Shape a teaspoonful of mixture into balls. Place balls on wax paper lined baking sheets. Chill for 1 hour. Remove from refrigerator. Melt dipping chocolate in a double boiler or medium microwaveable bowl on low until melted, stirring often. 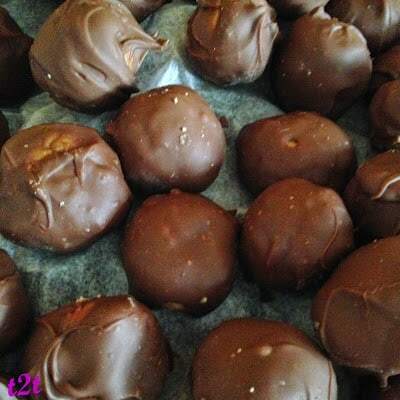 Using a fork, dip peanut butter balls into melted chocolate, covering well. Tap fork against side of pan to remove excess chocolate. Place on wire cooling rack. Sprinkle tops with sea salt or sprinkle tops with sprinkles, if desired. Set aside in a cool place until chocolate is set. 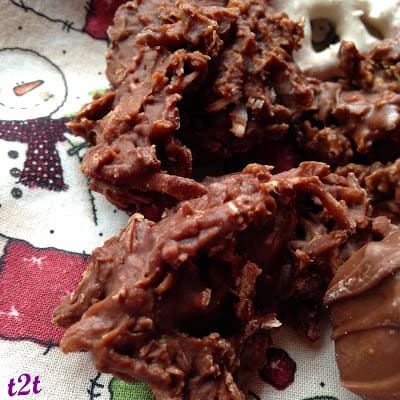 Melt chocolate in a double boiler or in a medium microwavable bowl on low until melted. Stirring often and keep a watchful eye on chocolate. Drop by rounded teaspoonfuls onto wax paper lined baking sheets. Set in a cool place to allow chocolate to set. 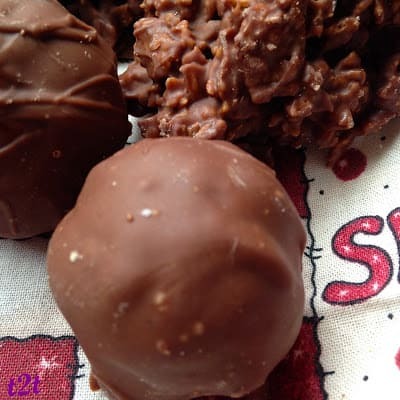 Melt chocolate in a double boiler or in a medium microwavable bowl on low until melted. Stirring often and keeping a watchful eye on chocolate. Add crushed cereal and stir until well coated. (Add more crushed cereal if necessary) Drop by rounded teaspoonfuls onto wax paper lined baking sheets. Crush candy canes in a large ziplock baggie, using a hammer or other hard object. Set aside. Melt white chocolate in a double boiler or in medium bowl in microwave on low until melted. Stirring often and keeping a watchful eye on the chocolate. 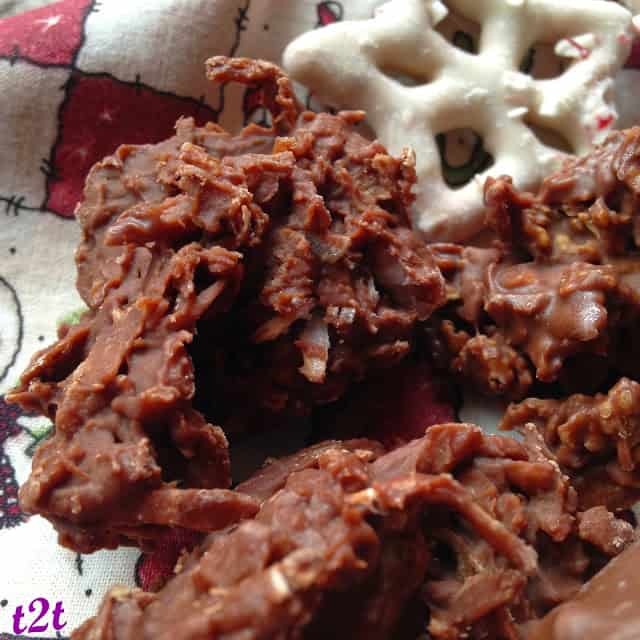 Using a fork, dip pretzels into melted chocolate. Tap fork against side of pan to remove excess chocolate. Lay pretzels on wire rack. 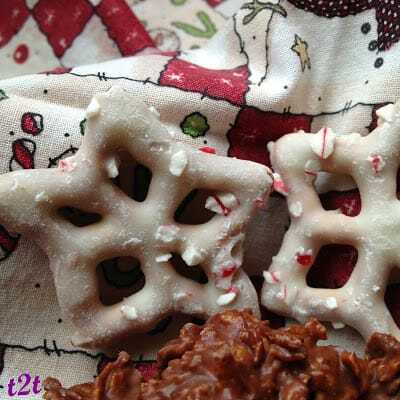 Sprinkle with crushed peppermint candy, lightly pressing into chocolate if necessary. Melt chocolate in a double boiler or in a medium microwavable bowl on low until melted. Stirring often and keeping a watchful eye on chocolate. Add Spanish peanuts and stir until well coated. (Add more or less peanuts as desired) Drop by rounded teaspoonfuls onto wax paper lined baking sheets. Store chocolates in a large air-tight plastic container between sheets of wax paper or parchment paper. Store chocolates in a cool place or refrigerator. Homemade chocolates tend to melt faster (in a warm environment) than regular store bought candy bars. Living in WI, I store my chocolates in the garage where it’s nice and cold. Use Good Quality Dipping Chocolate such as Ambrosia Chocolate. 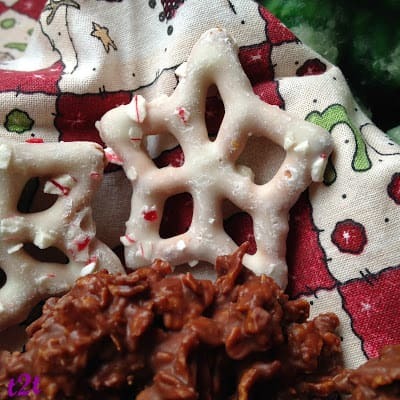 Turtle Pretzels and Lemon Cream Bonbons are two more delicious recipes for Christmas Candy you are sure to love.